She doesn&apos;t need much more validation, but winning a 23rd Grand Slam title pretty much shuts the door on any argument against Serena Williams being the greatest of all-time. This morning, Williams battled through an emotional Australian Open final against her sister Venus to become the winningest champion in the Open Era. Next on her radar, Margaret court, a pre-Open Era champion with 24 titles to her name. 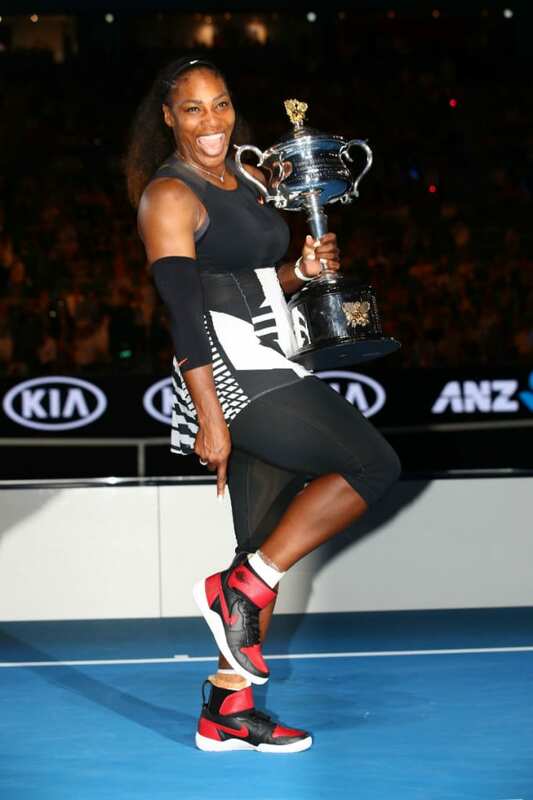 A sign of appreciation from one GOAT to another, Williams was gifted a pair of #23 lasered Air Jordan 1 x Nike Flare sneakers in the "Banned" colorway to wear during her post-match celebration. Serena-inspired Air Jordans, including this hybrid, will be releasing this year. According to SNKRS, the NikeCourt Flare AJ1 will drop Monday, Jan. 30 for $200.